My original plan was to just use a normal planter box for terrestrial plants, but then i remembered that i had a spare low-profile glass tank (L40cm x D25cm x H18cm) that was able to fit nicely on the shelf, so i cleaned it and filled the bottom with a simple sand base, then planted it with Anubias Barteri var. Angustifolia (glued to individual small rocks) and further surrounded with more rocks. 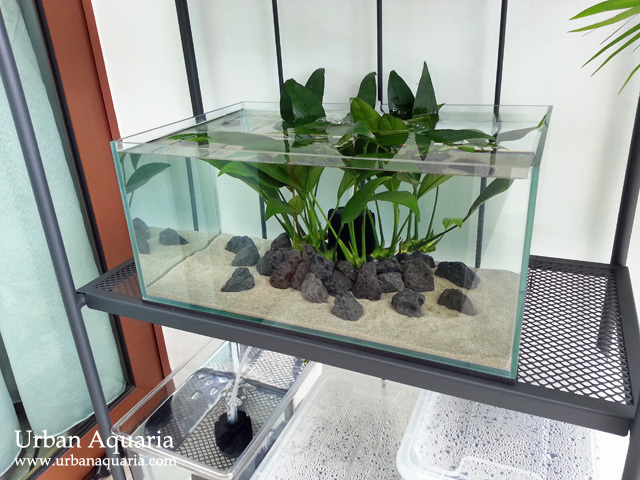 Filtration and oxygenation is supplied by a small sponge filter (its sitting just behind the plants). Some of the anubias plant leaves currently poke out of the water surface but parts of it are still underwater so the leaves are kept hydrated. Hopefully by the time the leaves start to grow taller out of the water they should have adapted back to emersed form. No fauna at the moment... though i'll probably add in a few small hardy fishes soon to prevent mosquito breeding. The tank is positioned in a shaded area and blocked by other plants but it still gets indirect sunlight for most of the day. Thats actually a steel shelving with powder coating, its designed for outdoor usage. Okay, while the dimensions for that outdoor rack lists its depth at 32cm, that is the total depth of the entire structure (including the side beams)... the actual depth of the shelves themselves are only 25cm. 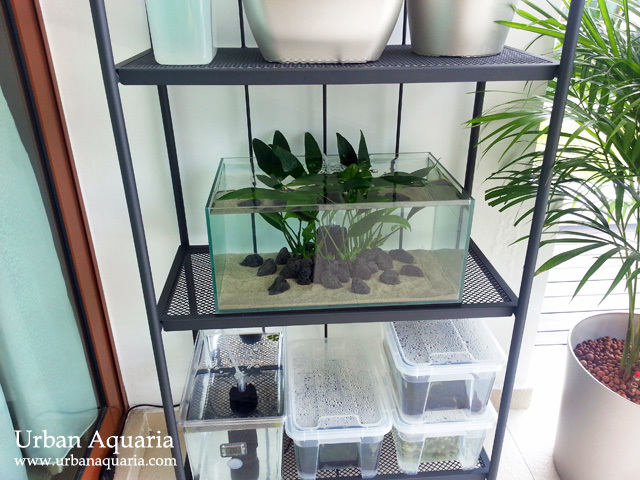 If you look at my follow up outdoor tank iterations, i actually custom made a low-profile 2ft tank with special 25cm depth dimensions to fit the shelving. As for whether the shelves on that outdoor rack are strong enough to hold a full size 2ft tank, it'll probably not be advisable as the listed max. load per shelf is only 24kg. The low-profile tanks i use on the rack only work out to around 20-30+ kg range, so they are still more or less close to the recommended load limits. For comparison, a full size tall profile 2ft tank (60x30x45) like yours works out to 81 liters of water volume... along with the weight of the glass tank, it'll probably total up close to 100 kg. That rack will not be able to hold such heavy load. Therefore in your particular case, its best to look for much stronger racks or cabinets to hold that tank size and weight.